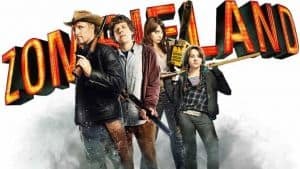 Zombieland 2 Release Date Set for October 2019 | Nerd Much? A box of Twinkies to anyone who saw this one coming. Zombieland 2 is getting closer to officially happening with the original cast in tow. It’s been nearly nine years since the first movie debuted in October of 2009. And with the tenth anniversary on the horizon, one of the writers of the original is teasing that the sequel could be heading our way as the ultimate form of celebration. Rhett Rease and Paul Wernick were the duo that wrote the original Zombieland. And since their efforts on the post-apocalyptic horror/comedy, the duo have only become more prominent. They wrote Deadpool and Deadpool 2 with the assistance of Ryan Reynolds. As well as the upcoming new adaptation of the board game Clue. They’re also attached to Michael Bay’s Six Underground and the Chris Pratt led Cowboy Ninja Viking. The original cast was comprised of Woody Harrelson’s Tallahassee, Jesse Eisenberg’s Columbus, Emma Stone’s Wichita and Abigail Benson’s Little Rock. Bill Murray also had a extended cameo within the film that many heightened the hilarity to another level. All of the former cast members have expressed interest in returning for a sequel. The first movie was both critically and commercially acclaimed. It earned over $100 million on a budget of $24 million. Rotten Tomatoes has an approval rating of 90% for the movie with a current Metascore of 73. As stated by Wernick, the current hope is that filming begins in early 2019 for an October 2019 release. Ruben Fleischer, director of the original, is expected to return as well. We’ll have to wait and see whether Columbia pulls the trigger and makes the whole thing official. But in the meantime, checkout what other zombie films are headed our way with Nerd Much’s comprehensive list.